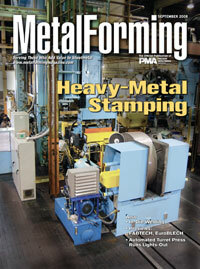 Heavy-metal stamper Stamco Industries rejuvenates a 3000-ton transfer-press line used to stamp thick HSLA steel by installing a new, robust coil line. Downtime is down, press speed and throughput are up, as is press capacity--by 15 percent. Rockford Toolcraft proves bigger (and stronger) is better as it tools up a rebuilt and reengineered transfer press--built of two twin-ram 2200-ton presses--to process coil-fed steel to in. thick. ...to ensure optimum results, whether welding fabricated sheetmetal assemblies or performing tool and die repairs. Quality, Flexibility, Productivity is the theme for the world's largest sheetmetal-technology show, slated for October in Hanover, Germany. These MetalForming advertisers will be exhibiting in Las Vegas. Go to www.metalformingmagazine.com/previews to find more booth previews. Low-cost competition from China combined with outdated fabricating equipment and manufacturing techniques threatened this Seattle heater manufacturer. A new automated turret punch press allows use of advanced software and tooling to streamline the part-making process. Given sufficient volumes and proper technology setup, in-die welding can save big over stamping then welding as a secondary process. Heres the proof. Sun Sets on Manufacturing Dominance, But Where Will It Rise?